Air quality and the associated subjective and health-related quality of life are among the important topics of our time. However, it is very difficult for many cities to take measures that to accommodate today’s needs concerning e.g. mobility, housing and work, because a consistent data base with fine-granular data and information on causal chains is missing. This has the potential to change, as today, both large-scale basic data as well as new promising measuring approaches are becoming available. Project “SmartAQnet” is based on a pragmatic, data driven approach, which for the first time combines existing data sets with a networked mobile measurement strategy. 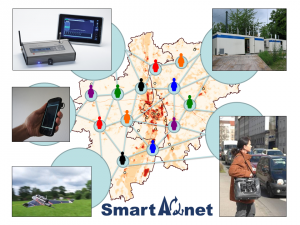 By connecting open data, such as weather data or development plans, remote sensing of influencing factors, and new mobile measurement approaches, such as participatory with ultra-low sensor technology, “scientific scouts” and demand-oriented measurements by light weight UAVs, a novel measuring and analysis concept is created within the model region of Augsburg. In addition to novel analytics, a prototypical technology stack is planned which, through modern analytics methods and Big Data and IoT technologies, enables application in a scalable way.